Project obstacles and solutions: Pilot Flying J Corporation announced it would build a new Travel Center in Marion, Indiana on the site of a former Marathon station. Advanced Project Solutions (APS) was named the general contractor for the new Flying J Auto Truck Stop. From the demolition of the old station to turnkey operations, APS had 120 days to complete the construction. APS self-performed the excavating, concrete flatwork, asphalt paving and concrete curb work. They contacted IMI Aggregates to provide stone for a paving subbase, fuel tank pits and retention pond erosion control. In the course of conversation, they learned about the breadth of services offered by the IMI Group of Companies. In one meeting, they were able to secure soil stabilization from Specialties Company, stone from IMI Aggregates, concrete from IMI Concrete, and asphalt from E&B Paving. By working with the group, APS was able to have a single point of contact to coordinate the delivery of building materials. IMI Aggregates supplied 25,000 tons of subbase stone for this project. IMI Concrete provided 2,000 yards of concrete. E&B Paving supplied 11,000 tons of HMA. 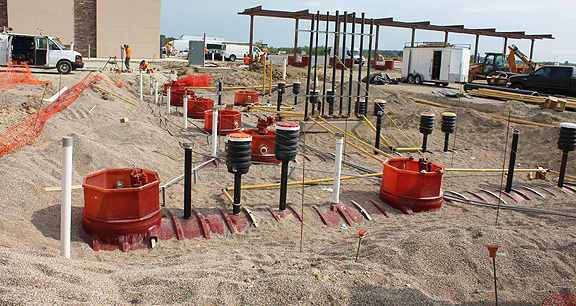 Specialties Company stabilized 38,000 square yards of surface soil to a depth of 12 inches, adding 780 tons of cement to help dry out and strengthen the subbase under the pavement. Pilot opened the new Flying J Travel Center in October 2016. For more information on multiple building products from IMI, contact the sales representative for the plant nearest your location. Click here.